Zotero is a free, easy-to-use tool that stores, organizes, and cites your references conveniently all in one place. Referenced items are added to your library and can be synced with the Zotero website, making your references accessible on the web from multiple locations. It supports private and public collaborations, and offers 300MB of free online storage. You have the option to purchase additional storage. Choose which version to download and install on computer or in browser. If you normally use Firefox for browsing, then you can install just the "Zotero for Firefox" option, which is a full Zotero installation. If you use another browser, like Google Chrome or Safari, then you need to install both "Zotero Standalone" and the correct browser plugin for your browser. If you want to, you can install both the Firefox plugin and Zotero Standalone. Once downloaded a Zotero Icon will appear on your desktop , if you have chosen the standalone version, and on the toolbar in your browser regardless of which version chosen. Set up syncing. This is also a good way to back up your collection. First, register for a free Zotero.org account, which gives you access to the syncing and collaboration features. Citations can be imported into Zotero from many Western Libraries databases, websites, and PDF documents. How this is done will depend on where the citation is coming from. If you are using Zotero for Firefox, click on the "Z" icon in the Firefox toolbar to open the Zotero tab in your browser. In saving your references for import into Zotero, see if the database allows capture in any of the above formats. Once you've exported the references from the database, use the "Import..." option in the Zotero "gear" menu to load them into your account. Zotero can automatically create bibliographies and format citations in documents, assignments, manuscripts, and more in a multitude of different citation styles. 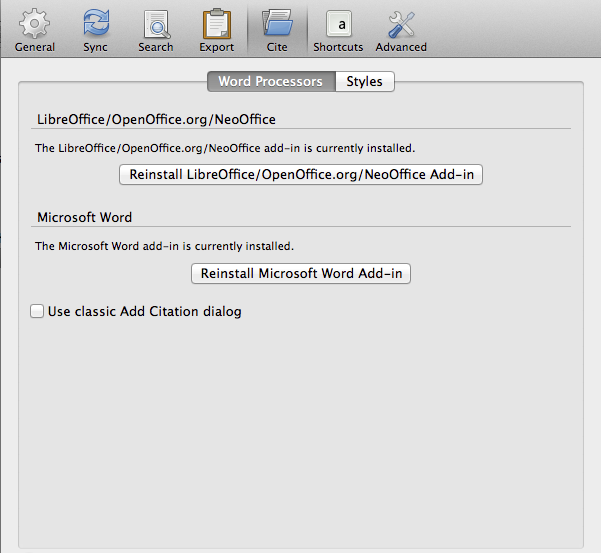 Once the plugin has been installed, a custom menu bar will appear in Word under the Add-Ins tab to indicate this. Use this toolbar to automatically format in-text citations, endnotes, footnotes, and bibliographies. 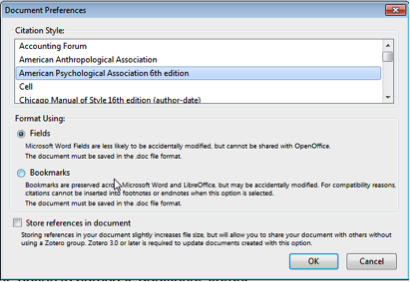 Open an existing or new Word document along with Zotero. Place your cursor where you would like the reference to go and click on the icon. 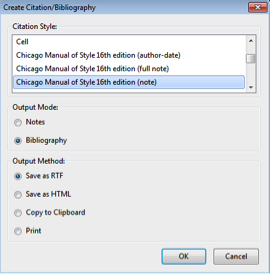 The first time you do this a Document Preferences dialog box will appear allowing the choice of a particular citation style. 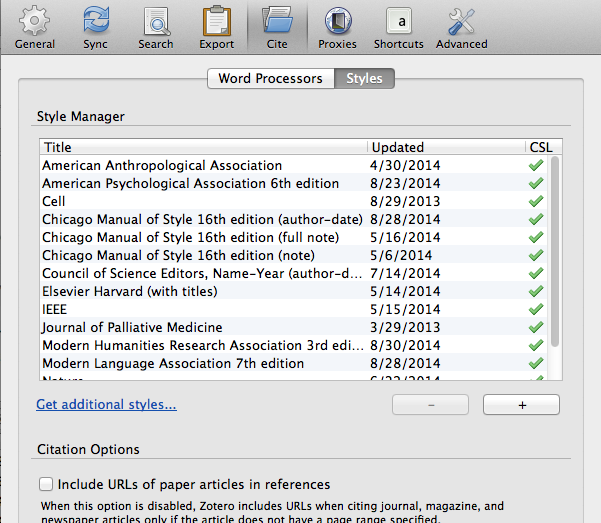 Zotero comes with the most common citation styles pre-installed, but if you need a style that isn't listed, you can add more using the Styles section of the Cite tab in the Zotero preferences. Just click on the "Get additional styles" link, search for the style you need, and install it. Click OK and you will be returned to your document. Ensure the cursor is in correct position for the in-text citation. Another dialog box will appear to choose the citation(s) that need to appear in that spot. Should the Add/Edit Citation box not appear then clicking the "Insert Citation" icon will open it up. Click on OK to return to your document. An in-text citation will appear where the cursor was originally, formatted according to the citation style you selected. When all the necessary citations have been inserted throughout the document, place your cursor at the position that the bibliography should appear. Then click on the "Insert Bibliography" icon to generate the bibliography. It should now appear in the correct format for the citation style you chose. If all you need to do is create a list of references to email to someone or post to a website, it is not necessary to use the Word plugin for this. You can create a bibliography directly within Zotero. Select the Style, Output Mode and Output Method and then follow the prompts depending on the selections you have made. 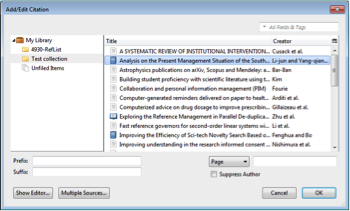 Zotero facilitates the management and formatting of citations. However, it is vital that you check the citation data at the import stage and check the formatting of your in-text citations and the generated bibliography to ensure the completeness and accuracy of the data captured or the references being produced. For more assistance and support in using Zotero please refer to Zotero's support pages. Contact us for assistance with Zotero questions and problems.